The Society for New Music is presenting “Paradise,” a world premiere interactive sound installation. Immerse yourself in the virtual Garden of Nature by way of this interactive environment featuring soundscapes and the voices of creatures from around the world. Thursday, June 9, from 4-7 p.m.
Friday, June 10, from 4-7 p.m.
Saturday, June 11, from 3-6 p.m.
Wednesday, June 15, from 4-7 p.m.
Thursday, June 16, from 4-7 p.m.
Friday, June 17, from 4-7 p.m.
Where else can you hear Weddell and leopard seals, Orcas, beluga whales and the most amazing variety of birds from every continent? And glaciers, too, but at a safe distance. 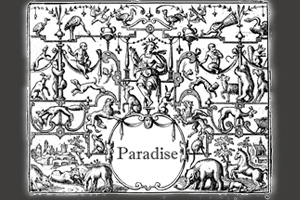 “Paradise,” which was commissioned by the Society for New Music, is presented in cooperation with Syracuse Stage and the College of Visual and Performing Arts’ Department of Drama. It will be featured at this year’s Third International Performance Art Week in Venice, Italy, in December, but Central New Yorkers can experience it here first! Meet the artists: Douglas Quin is a world renowned sound designer, naturalist, public radio commentator and music composer, and co-director of the audio arts graduate program in the S.I. Newhouse School of Public Communications. Projects include “Polar Suite” composed for Kronos Quartet, featuring soundscapes and interactive electronics, sound design for “Jurassic Park III” and other films and exhibits. He is the recipient of numerous awards and grants including the Ars Acustica International prize and multiple fellowships in music composition from the National Endowment for the Arts and the National Science Foundation. Lorne Covington, fluent with visual and performing art, electronic hardware, embedded systems and all layers of software development, creates immersive responsive environments using cutting-edge sensing and software technologies. Covington’s work focuses on the intangible space between action and response, the moment-to-moment experience of involvement with a complex system that turns the act of viewing into one of exploration, creation and play. Recent projects include “Affectations” at the Kennedy Center, “Dancing Light Theater” at the MOST in Syracuse and the JournoWall Participatory Media Environment at the Newhouse School, where students and faculty can interact with large-scale visual information and sound.